My family recently had a mini getaway to Vancouver, BC. 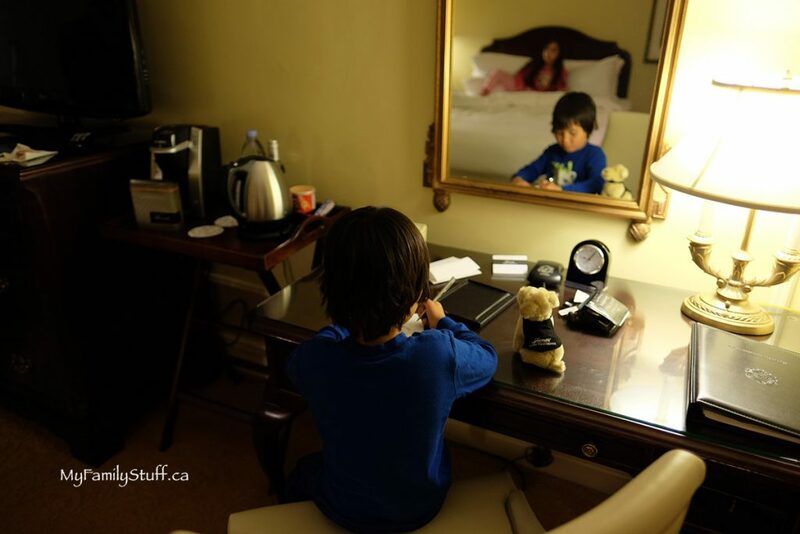 For this getaway, we decided to stay at the Fairmont Hotel Vancouver. As a child, I had stayed at the Hotel Vancouver many times with my family. It had been over 15 years since my last visit. 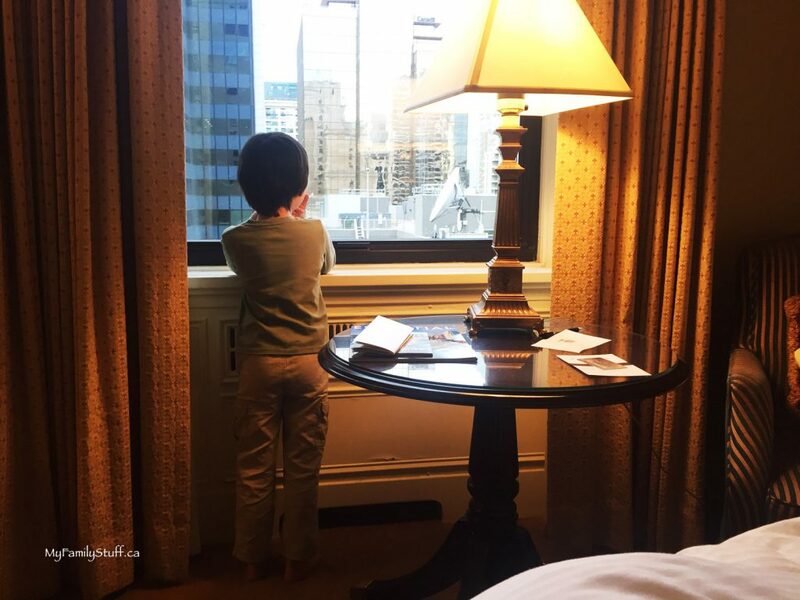 It was exciting (and nostalgic) to take my children to experience this beautiful hotel in the city of Vancouver. The Fairmont Hotel Vancouver is a luxury hotel situated in the heart of Vancouver. Perhaps the most impressive thing about the Fairmont Hotel Vancouver is its location. It is across the street from the Vancouver Art Gallery, minutes from Nordstrom and Pacific Centre, a short walk to Robson and Coal Harbour. I so appreciated being able to walk everywhere in the downtown core. We were attending an event at the Vancouver Convention Centre and were able to get there on foot (with our two kids) in about 15 minutes. Check in was smooth and fast. My kids felt they were walking into a castle when we arrived. For this visit, we stayed in a Deluxe Room. The room was very well laid out, had a long hallway, a large walk-in closet, a roomy bathroom and two very comfortable Queen sized beds. We had a great view of the city from our window. This room was the perfect size for our family. 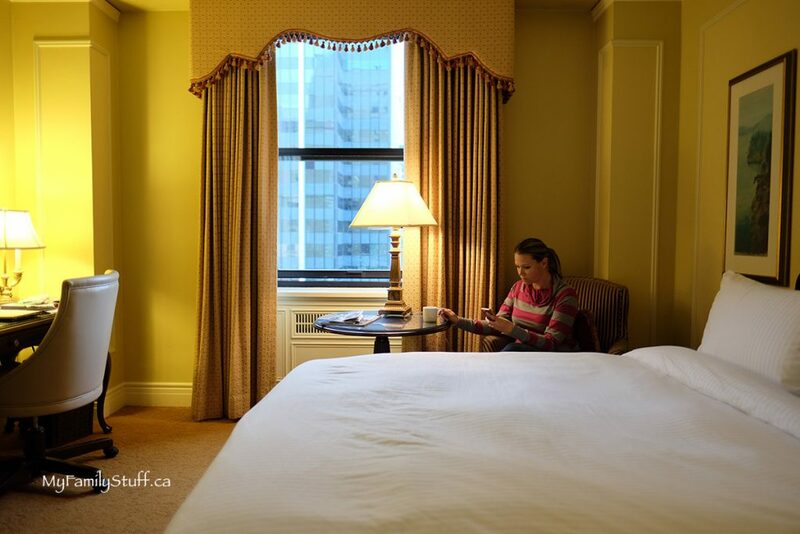 The Hotel Vancouver has several other room types including the Fairmont Room, Junior Suites, and One Bedroom suites. 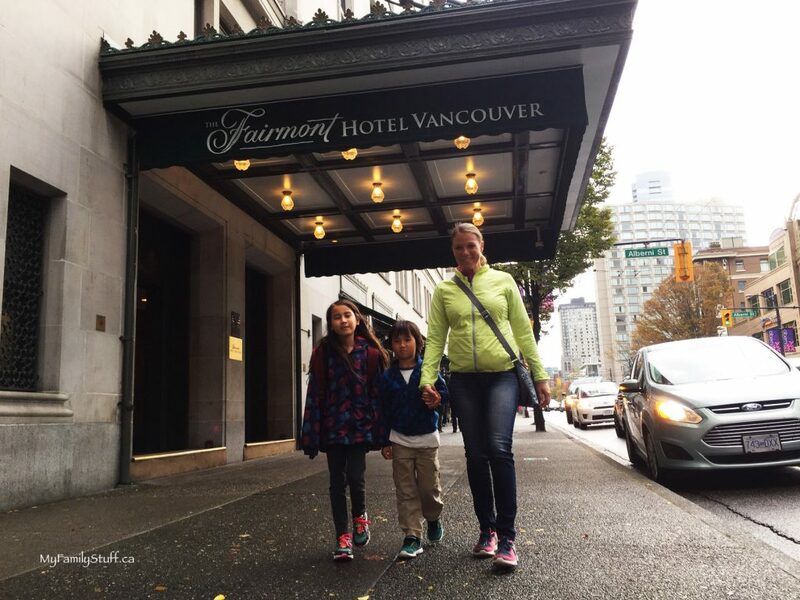 We were so impressed with the service and little perks that came with staying at the Fairmont Hotel Vancouver. Our favourite thing was the free milk and cookies that my kids were given each evening during our stay. We ordered milk and cookies on both nights and it was a hit. 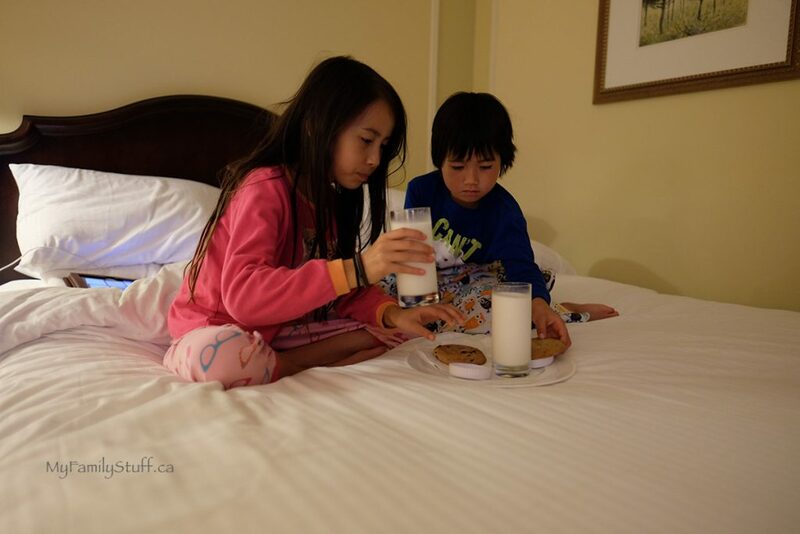 My kids thought it was very cool to phone room service and loved that milk and cookies were delivered to our room just for them. We had a breakfast package with our stay. This was by far the biggest treat for my husband and I. 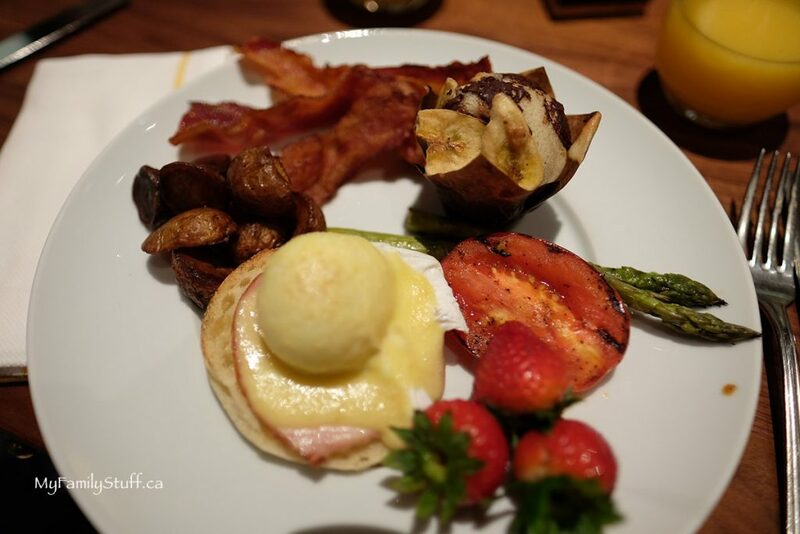 On both mornings we enjoyed the delicious buffet breakfast at Notch8 in the main lobby. The entire family loved all the hot breakfast entrees and the fresh fruit. The pastries were also extremely tasty. I would absolutely recommend the breakfast package when staying at this hotel. 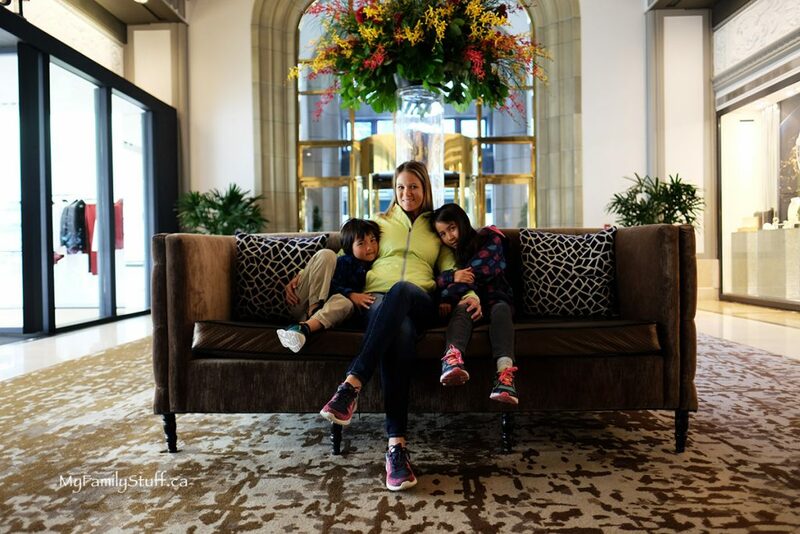 We absolutely loved our two night stay at the Fairmont Hotel Vancouver. It was a very special getaway. Every staff member we came in contact with was polite and helpful. The proximity of this hotel to attractions in Vancouver is tough to beat. The modern lobby, wonderful restaurant and beautiful room made our stay perfect. Our only disappointment was that the indoor pool was closed for maintenance during our stay. This only means we’ll have to stay there again once it is re-opened. 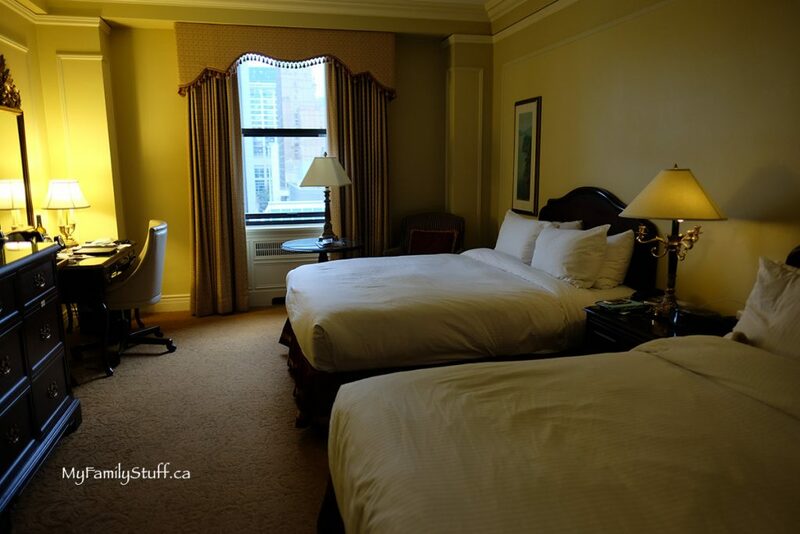 I highly recommend staying at the Fairmont Hotel Vancouver when visiting Vancouver. This luxury hotel is perfect for a special family vacation, a romantic getaway or a girl’s weekend. I’d love to know, what do you love about staying in a hotel with your family? Disclosure: I was given special perks from the Fairmont Hotel Vancouver to facilitate this review. All thoughts and opinions are always my own. What a great treat to have cookies and milk. It is all about the little touches. I’ve only been in the lobby but it was a remarkable hotel. Perfect for a family getaway. We will definitely look into it when we are in Vancouver next. It’s nice to have staycations and to check out some popular and amazing sites that we never get a chance to do on a normal day! This looks like a great vacation spot! I will definitely check it out sometime. Thanks for the review. An amazing breakfast to start the day ! If i am ever in the area i will remember the name it sure looks like a nice place and the food looks amazing. I have had many occasions to stay at Fairmont hotels and resorts and they are always top notch. In fact you always feel a bit spoiled when you stay at a Fairmont. It’s been a couple of years now since I made it to Vancouver. I think it’s time to visit again. This seems centrally located and convenient and such a lovely clean family friendly accommodation as well. I would definitely consider for my next trip out west. That looks like an amazing breakfast buffet!! & I love the cookies & milk!! My daughter would be sold on the milk and cookies. It’s the little things that the kids remember most and make for great family memories! 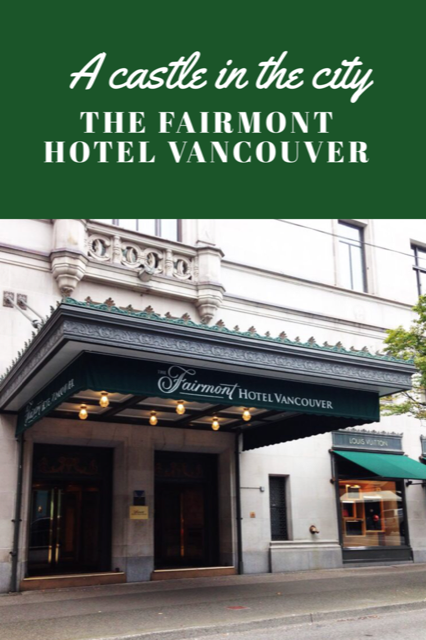 I always love a stay at any Fairmont – will have to remember this for a Vancouver trip! Sounds like such a wonderful place to stay! I’d love being within walking distance of all those great places too. Wow. Just… wow. I want to visit here so badly right now! Vancouver isn’t one I’ve thought about, but with accommodations like those, I might just have to make the trip. The milk and cookies would be a huge hit with kids. One perk we usually look for is a pool. We love to swim when we stay at hotel, but if that is not available then we hope for great front desk employees who will share insider tips about off the beaten path things to do. My kids would definitely love the free milk and cookies! Looks like you guys had a great time! Milk and cookies for the kids – what an awesome touch! I have never heard of a hotel doing that before. Always love your reviews! This is definitely next on our list!